The snow is gone and the end of the school year is fast approaching. Miss Gina and I often survey and evaluate how the children are learning and try to find ways we can tweek or modify an activity or section of the room. This past month we were concerned about the block area and we had many conversations about it. In Room 2, we take time to observe the children throughout the day, but especially at work time. We monitor where the children go during work time and watch to see if the different areas of the room are being utilized correctly. For instance, we observed that during work time, they were only using the large hollow blocks and not building with the smaller unit blocks at all. Because of this we removed the large hollow blocks. Then we brought in pictures of structures, some temples, other buildings in cities and some pictures of unit block structures, laminated and put them in the block area. The next day we had a small group activity where we broke the class into groups of 3 or 4, gave them a picture of a unit block structure and some blocks. We assisted them as they copied the structure on the paper, using the unit blocks. This was a big success! 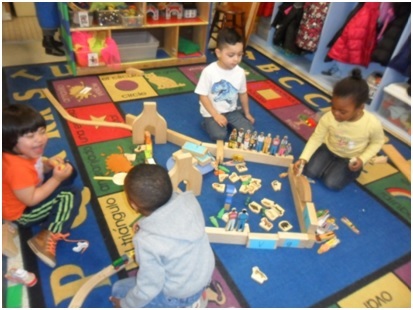 We took pictures of the children at small group time and work time while they were engaged with the blocks. They were enthusiastic about using the pictures to give them ideas on structure building. You may think that this is no big deal, but it is! The block area (to me, as a teacher) is the most important area in the room. It encourages so much skill building and it is an area that is very flexible. This area scaffolds skill building in the following areas: social cooperation, spatial awareness, geometry, fine motor skills, eye hand coordination, problem solving, creative thinking, exploration, imagination and make believe play. They will eventually investigate balance, patterns, symmetry, sorting, comparing and contrasting. These are just some of the skills the children get practice in when they are engaged here. Newer PostRoom 3: Preschoolers enjoying the Spring!